How Teach to One is helping educators personalize learning and increase student motivation. When Aaron Kaswell first began teaching seven years ago, he immediately recognized the magnitude of the challenge facing him. His school-issued textbooks were written for sixth grade children and he possessed an in-depth knowledge of the middle school math content he would teach. But, there was 28 students with unique skills and abilities in his class and only one of him. 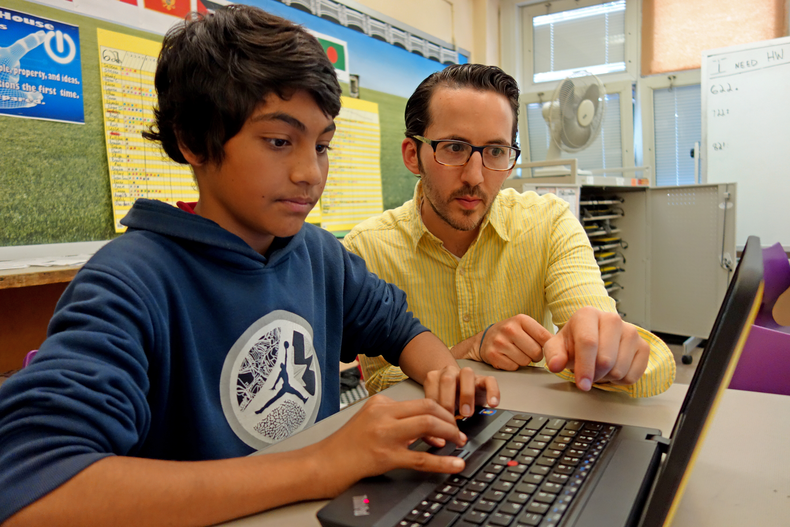 Getting all of his students ready for seventh grade when some children struggled to add while others were ready for complex algebraic expressions seemed overwhelming to the first-year teacher. “Even at my best, I could really only differentiate for 3, maybe 4, levels of learning. That in itself was a monumental task,” says Aaron. Yet, Aaron was determined to meet each student at his or her learning level. He devised a strategy to adjust his instruction to each child that he called “Like it, Love it, Gotta have it”. Each night, he spent hours adapting lesson plans and worksheets into three difficulty levels. After introducing a new math concept in class, he asked students to self-assess their understanding of the skill. Students who weren’t feeling confident went to the “Like it” section of the room, where they found a worksheet adapted to the basics of the concept and where Aaron could spend more time with them. A more challenging adaption would be found in the “Love it” area. Students confident in their understanding could explore even more complex problems and exercises in the “Gotta have it” area. Using a mixture of existing school testing data and short assessments, New Classrooms identifies each student’s learning level. When they arrive at school each day, students receive a schedule customized to their ability and skill level. Rotating through large group, small group, and individual instruction, students encounter skills they are prepared to learn. This is a game changer for teachers, says Aaron. “With [ Teach to One ] I can differentiate within a group and really target students. I don’t have to plan anymore for students who are all over the map, ” he says. Seventh grader Mohammed exemplifies the powerful impact personalized learning can have on a student. “Before, I didn’t get that good of grades in math,” Mohammed says. “In the traditional class it takes you a long time to figure out your grades, so you wouldn’t know if you are improving or what you need to improve.” Mohammed had the motivation to learn, but he felt lost in the shuffle of the traditional classroom and lacked the tools to truly take control of his learning. “Before, not all the students were all in the same place, so maybe we’d all have to redo a skill,” Mohammed says about his experience before Teach to One. “That’s kind of wasted time. In [ Teach to One], I can go at my own pace. I don’t need to interrupt the teacher with a different lesson. I can do it on my own. Before I was not really that engaged, but now that I know I’m doing better, I’m more engaged.” Mohammed now arrives an hour before school starts each day to login to the Teach to Oneportal, review his progress and work on practice exercises in preparation for future lessons.